Welcome to Jingle Poetry Potluck Week 44, and I must thank you all for an amazing response we got with your lovely posts. It was great being there and spending some time with loads of coffee and reading great posts. And I am SHASHI going on to my 2nd week at another beautiful week of Poetry Potluck. Now coming to Poetry Potluck theme of this week "Painting Whispers” !!!... Some times, when we come across a great painting, or a creative work or a natural beauty... it triggers in us some latent thought, words come out pouring and you end up writing a master piece on whatever you could find ... a napkin, a paper program or on the back of the pamphlet you have been handed over at the museum. How to Submit My Poetry? Add your entry via InLinkz below by clicking on the blue button, and leave a comment in case it is your first time! It would be great if you could link back to us on your blog. Thanks for joining us to support poetry, poetry promotion, and poetry sharing here at Jingle Poetry Monday Poetry Potluck!!! Please share your poetry and have fun! painting is very romantic word, love the theme this week. I think this is going to be my favorite week here ever. I love art and the poems you feature are amazing. Klimt's work is so stunning. Shashi, you may link in your poem in to share. there is enough time for all to come and enjoy poetry, so breathe easy. I'm in. :) Have a great week ahead, everyone! Yes, sometimes I write from feelings a picture has evoked. Deep poetry & amazing painting. Very fitting Music of the Week. Have a wonderful Potluck everyone! at poets rally, we prefer one entry, yet, some poets submit more than one, we don't want to hurt the poets thus did not delete additional ones, but the rule is clearly stated. YEs, you are right, we poetry potluck we encourage free style of sharing, thus you can share 1 to 3 poems if you wish. Jingle, Thank you for the invite. I really appreicate you reaching out to me. Thanks to Jorie Graham for the contribution of her fine poem to this experience. 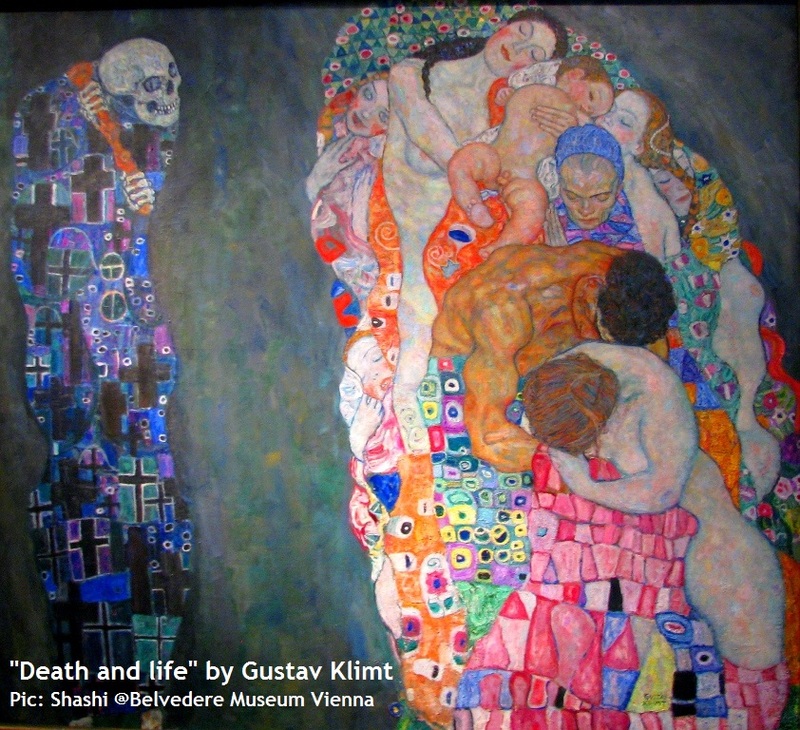 Beautiful poems, lovely painting (love Klimt)! I will get back with another poem that is more on topic later (still in a prolific phase)! Enjoy the potluck everyone! Hi. I'm sorry for asking, but I was just invited to this and I am a little confused. Would someone be able to explain it to me? I opted to share a slice of my weekend with you - A Day At The Beach - not theme related, but see if the poem and photographs I took whisper to you! happy potluck everyone!getting out my paintbrushes. Submitted one with my own choice of painting. No time to write, as I've been dealing with major computer issues all weekend. Trying to get everything loaded onto a new one this morning and get back into the swing of things. Will be reading and commenting this afternoon. Really enjoying participating in these rallys and such! Hope I'm doing things properly! love the theme of this week! Just entered a poem I wrote for Sunday Wordle 13. My first Villanelle. I know it has nothing to do with your painting...but still enjoy. To all Blogspot poets: I am having difficulty commenting on some of your sites. No idea why--probably something to do with the new computer. In any case, my apologies if you do not recieve a return comment from me. I continue to try, but on sites where I am not given the "Name/URL" option, I am many times turned away with a message that says my comment was not able to be processed. If anyone has advice as to how to solve this, please let me know! Sometimes our art is a mask. One we put in front of our supposedly true selves for the world to see. Ah, but our art is more true than we know and too late we find we have been exposed! Writing poetry is prayer for me. It can't be forced and I can't research it enough to choose a topic. It simply is or isn't. My poetry is how I express thoughts that are provoked by life. Read of me, and you shall know me more intimately than even my family. Nice theme. I am back at Jingle after a short break. Please find my work here. I sat down to write about a painting. Since both of my parents are artists, I thought it would be easy. But I ended up writing about an old photograph, instead. Oh well, best not to question the muse. I am thoroughly enjoying reading all this wonderful poetry from such talented people. Thanks Jingle and others who are behind this. Just linked in two short poems last night. I am on holiday now so I don´t have much time to write, but I hope that they will do. Superb prompt, but have I misunderstood: should there be more than one poem? You've come up with a fantastic theme...I'm sure all of us were inspired. wow this place is awesome. Happy potluck everyone. May I write something with the title "Painting Whispers" and submit that? That ideda inspire on it's own. Please check out my poetry! I'm sorry I haven't been posting regularly Jingle. almost didn't make it on time! i didn't get to do what i wanted to due to laptop problems, but hope this will suffice.